Windows, Apple MAC OS, and Chrome are all proprietary operating systems developed by companies that are totally focused on providing maximum compensation for their executives, therefore their operating systems are designed firstly to be marketing devices that wrestle you to their stores. Many people are getting fed up with this, that's why the open source Linux operating system is becoming so popular. But how do you install Linux? Another trend in the personal computer industry is to eliminate the optical drive. Actually, computer and software manufacturers would like to eliminate the hard drive too because if you install software on your computer and store your documents on your hard drive, they receive only a one-time chunk of money. What they really want is a continuous stream of money from you by leasing you software and storage in the cloud. In this article I'll show you a very simple way to install Linux on your computer. This method will run or install linux from a USB flash drive. You simply download the .iso file for the Linux distribution you prefer, and use a free application called Universal-USB-Installer to configure a flash drive as bootable and install Linux almost automatically. One thing you'll need to do, and you may as well do it first, is to configure your BIOS to boot from USB. This is not complicated nor harmful in any way to your computer. While your computer is booting you may see a message at the bottom of the screen indicating which key to press (usually F2) to access the BIOS configuration screen. Not all computers use the F2 key, so if you can't determine which key to press, do a google search with the name of your machine. Once you get into the BIOS configuration screen follow the instructions to move from page to page until you find the Boot Order screen. Generally you use the left and right arrow keys to move from page to page, and the up and down arrow keys to select the feature you want to configure. When you have selected Boot Order you'll see a list of the storage devices on your computer with the first one (usually the hard drive) at the top. 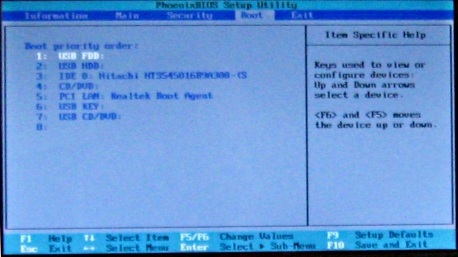 The BIOS screen will indicate which keys (usually F5 and F6) to use to move the selected device up or down in the boot order. Then follow the instructions to Save and Exit BIOS configuration. Changing the boot order will not harm your computer, except that it will take a little longer to start as it checks each storage device in the boot order for a bootable device. After you have installed Linux you can go back into the BIOS and reset the boot order to check hard drive first. Next, download the .iso file for the Linux distribution you prefer and place it on your desktop. There are many different Linux distributions. You might want to do some online research to determine which version of Linux is the best for you. The difference between them is that some are more command line oriented (for geeks) and some are more graphical and user friendly (for the rest of us). I recommend Ubuntu as the most user friendly. Each version has many different distributions, the difference being that older or lighter distributions are best for older computers, while the latest full versions are best for newer computers. If you want to try Linux on an older computer, I recommend Ubuntu LXDE. If you want to try Linux on a newer computer, I recommend the latest Ubuntu distribution. Download the .iso file for the Linux distribution you prefer, and place the file on your desktop. The next thing you'll need to do is download the Universal-USB-Installer application. It can be downloaded from dozens of sites, SOFTONIC appears to be a safe site from which to download it. Place the Universal-USB-Installer file on your desktop. There is nothing to install, it runs directly in Windows from the executable file you downloaded.